The vivo V15 Pro boasts a full-screen Super AMOLED screen with 6.39-inch diagonal and an extra tall 19.5:9 free of all kinds of cutouts and notches. 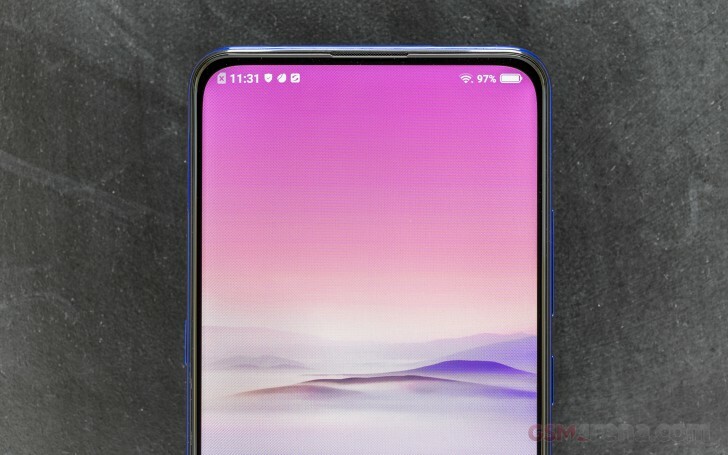 Vivo calls it Ultra FullView Display but it's just a fancy word for a notch-less nearly bezel-less screen. Performance-wise, though, the Super AMOLED screen used here isn't the best one we've seen but it definitely covers all the basic stats for a mid-range offering. Maximum brightness is okay and close to what you'd expect of a typical OLED - 429 nits. Max Auto mode didn't do much for us - just a few nits increase over the maximum. In any case, it should do fine outdoors in most scenarios. Unlikely to deliver great sunlight legibility under extreme conditions, though, like direct sunlight, for example. The color accuracy isn't the strongest suit of this phone either. The average dE2000 measured at maximum brightness is 5.8 with expected blue-ish whites. If you prefer a warmer look, you will find a color temperature slider in the Display settings menu but this will also blow the reds. Of course, this shouldn't worry you if you aren't doing any sort of color-sensitive work. Regards to battery life, our expectations were met. The vivo V15 Pro delivered excellent battery life thanks to its 3,700 mAh battery and (obviously) rather efficient Snapdragon 675 SoC. The use of AMOLED screen instead of an IPS panel must have helped a bit too. Web browsing and video playback times were slightly above average for the class but the standby score made it stand out even more. The 3G talk time shouldn't be overlooked as well. Our battery tests were automated thanks to SmartViser, using its viSer App. 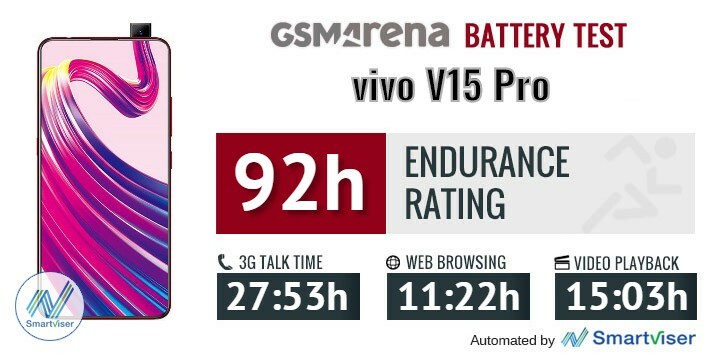 The endurance rating above denotes how long a single battery charge will last you if you use the vivo V15 Pro for an hour each of telephony, web browsing, and video playback daily. We've established this usage pattern so that our battery results are comparable across devices in the most common day-to-day tasks. The battery testing procedure is described in detail in case you're interested in the nitty-gritty. You can check out our complete battery test table, where you can see how all of the smartphones we've tested will compare under your own typical use. Unfortunately, when it comes to charging, the vivo V15 Pro doesn't really impress with speed. Despite the Dual-Engine Fast Charging tech, it looks like it's a standard Quick Charge 3.0 working over microUSB and the provided charger managed to fill up the battery from flat to only 38% in 30 minutes. Not all that impressive. At least the solid battery life makes up for that. The loudspeaker's loudness isn't exceptional but it's right above average. We've definitely seen louder ones. Quality-wise, the speaker doesn't impress as well. And since it's a bottom-firing single speaker, your hand might get in the way when watching videos. The vivo V15 Pro did very well in the first part of our audio quality test, where we hook it up to an active external amplifier. It reproduced our test track perfectly and at high volume. Things weren’t quite as perfect when headphones came into play - the stereo crosstalk raised notably, volume dropped to just above average and some intermodulation distortion crept in. A decent showing still, but not one to impress audiophiles.